Forced to stay in a nursing home while undergoing therapy, seventy-two year old, Mike Powell refuses to get out of bed, won’t cooperate with the nurses, and won’t take his medicine. At least not until he meets Elsa. The tiny, spunky little Elsa sparks new life into him. Seventy year old, Elsa -left in the home while her son takes a family vacation – joins forces with Mike, setting the home on its heels, and later discovers deception and fraud. Can they find happiness together? This is the first book is a long time that I actually couldn’t stop reading until the end. What those two came up with keeps you guessing. Every senior citizen should read this book and the younger generation should read it too and they will see that life doesn’t end at fifty…sixty or even seventy. 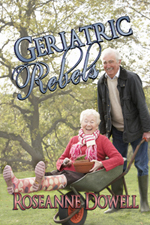 This is a warm, funny, comfortable read well-suited for readers of a certain age looking for novels about romance. It was light and flowed quickly. The characters were witty, funny, compassionate and very believeable. Their antics kept the pages turning in this novel.